Making biscuits used to scare the heck out of me. I’d follow the directions on the recipe, but somehow they would come out of the oven as hard as a hockey puck. So, for a long time, I decided that I’d never make a good biscuit. And for years, I didn’t try. And I’d laugh, because biscuits can’t be that hard to make. But, they were for me. I finally decided to try again. I got out a recipe and planned to make my grandmother proud. After all, she was the queen of making biscuits. She could whip up a sheet and have them in the oven before I even got done washing my hands for lunch. 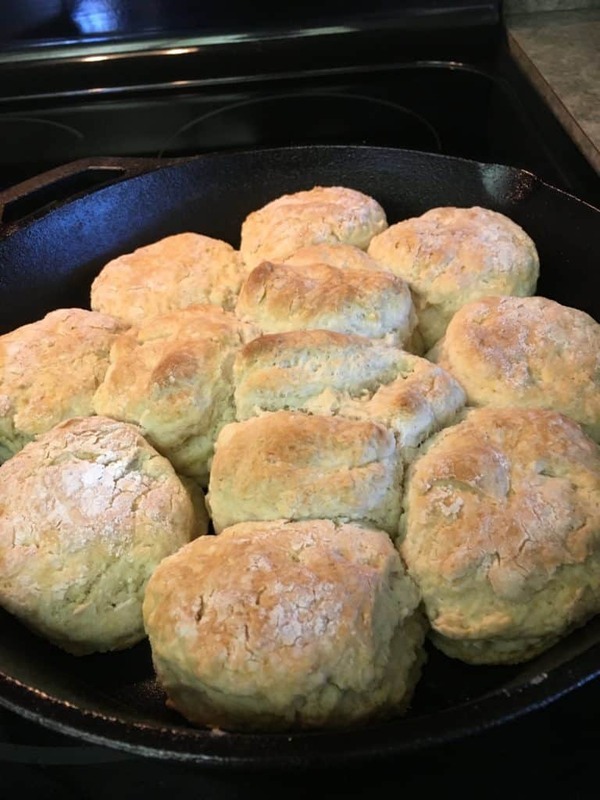 My grandmother lived in Tennessee, and in the South, biscuits are a staple–a way of life, especially at her table. She was an expert–so much that they even talked about her biscuits at her funeral. There is some serious comfort in a warm biscuit with a spoonful of whipped butter melting on top. In fact, I think buttermilk biscuits might be one of the top things in this world that bring me comfort. I recently broke out my cast iron skillet, and hoped to try some recipes in it. Why not biscuits? I was pleasantly surprised at the outcome. I buckled down and tried the recipe a few times, only to find out that I really could make some delicious biscuits without significant effort, and I didn’t have to throw them onto the ice rink for the hockey players. If you’re nervous about biscuits, try this recipe, and I know you’ll be pretty darn happy. The printable recipe, with measurements, is listed at the end of the post. Step 1: Add the flour, sugar, baking powder, and salt to the bowl. Mix it together and add softened butter. 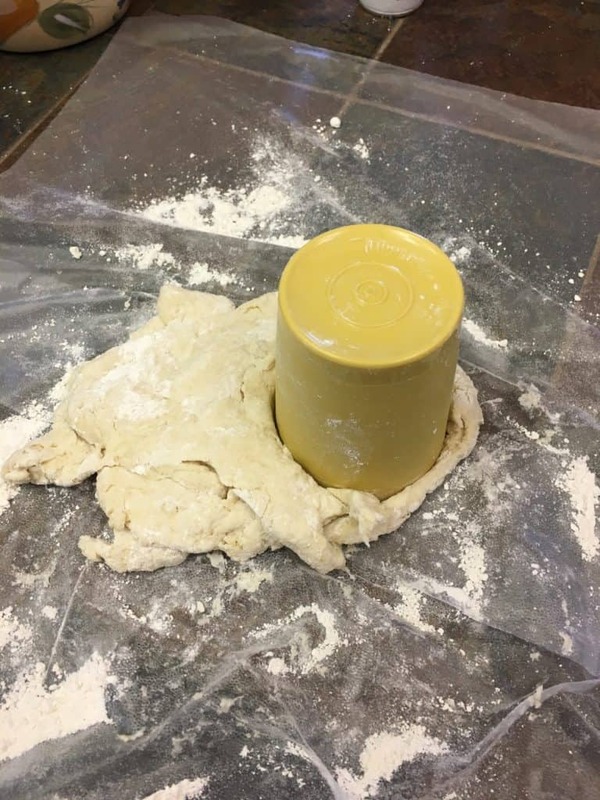 Start mixing the butter in with a fork until it creates little pea shapes in the flour. You can see in the picture below what it will start to look like. Step 2: Create a little valley in the middle and add the liquid buttermilk. Stir until the entire mixture is combined. Most of the time, I don’t need to add any extra buttermilk, but on occasion, if the mixture seems a little dry, add a teaspoon of buttermilk at a time. Once the mixture is combined and a tad sticky, you can set it out on the counter to press the dough out into biscuits. Try not to overwork it, because the biscuits might become a little too hard when they bake. Step 3: I place either Glad Press’n Seal, or wax paper down on the counter, and add a little flour. I usually press it out with a little flour on my hands, as well. I press it out until it is about 1-inch thick. My grandmother had a little cookie cutter to cut the biscuits. It looked older than me and worked perfectly. I didn’t have that, so instead, I grabbed a small Tupperware cup from the cabinet and used it. It was the perfect size for biscuits. Step 4: Add the dough to a buttered skillet or baking sheet and bake for 20-25 minutes on 425-degrees. When they are golden brown on the top, they are done! 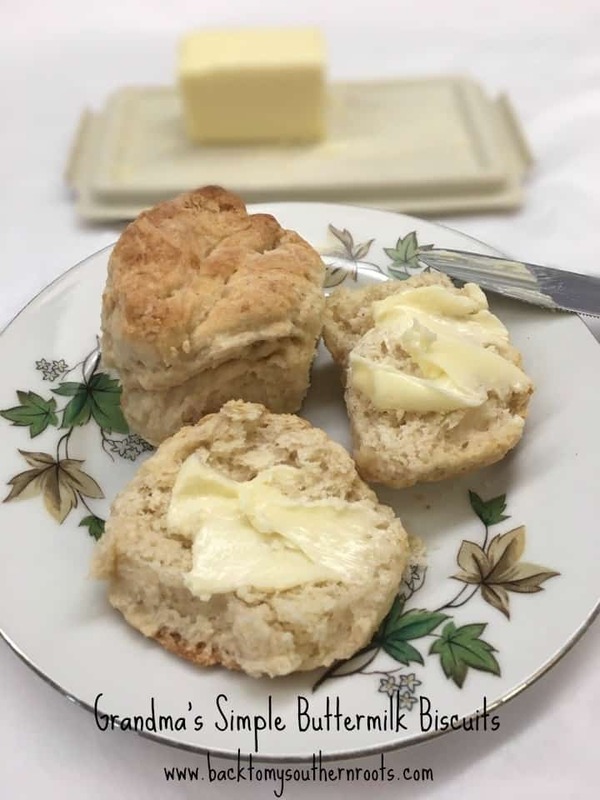 If you’re nervous about creating a hard biscuit, never fear, this recipe will give you the confidence to bring comfort right into your kitchen. And there’s nothing yummier than a warm biscuit with some butter and jelly on top. 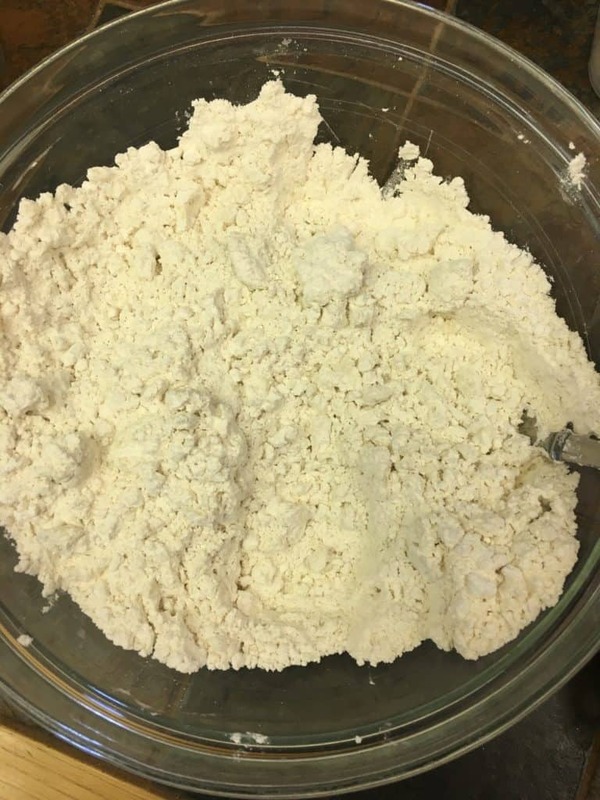 Mix the flour, sugar, baking powder and salt together in a medium-sized bowl. Add the butter and mix into the flour until you end up with little pea-sized bits. Add the buttermilk and stir until blended. 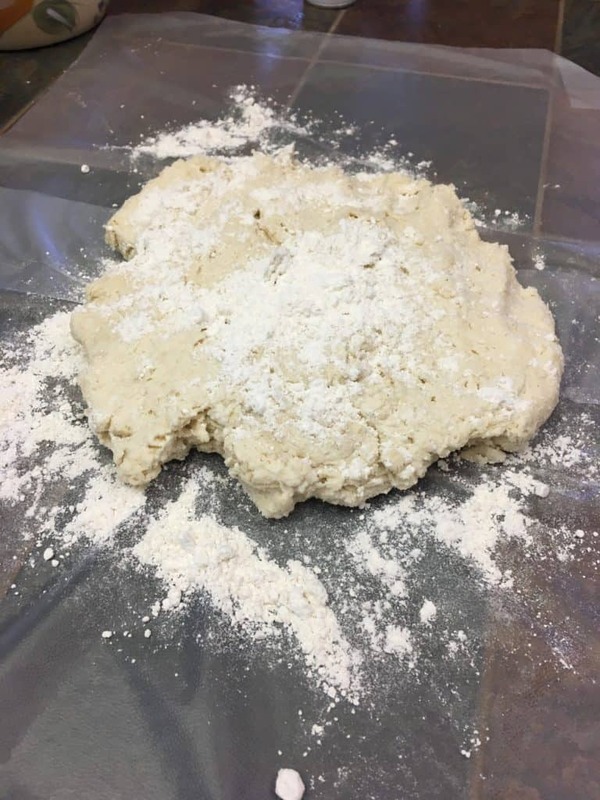 Place the dough on a floured surface and flatten out to about 1-inch thick. 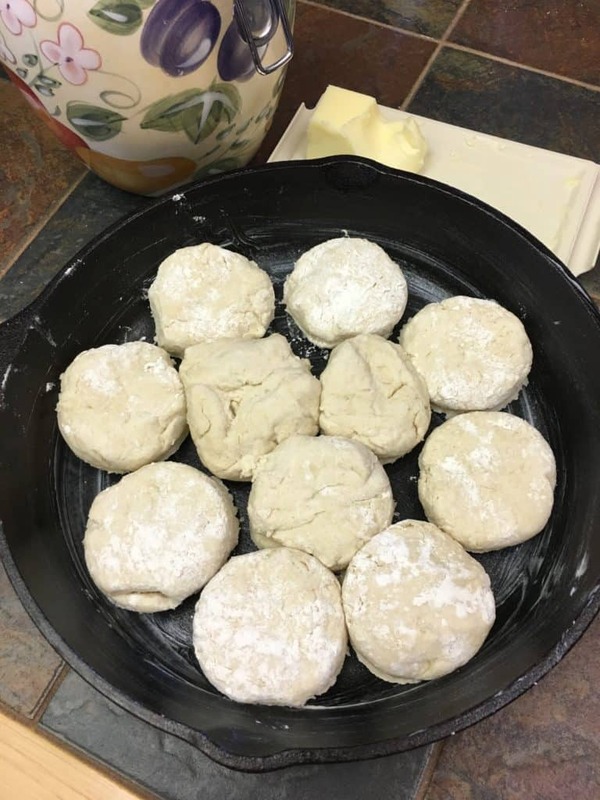 Cut out the biscuits and place into a buttered iron skillet or onto a baking sheet. Bake for 20-25 minutes, or until golden brown.